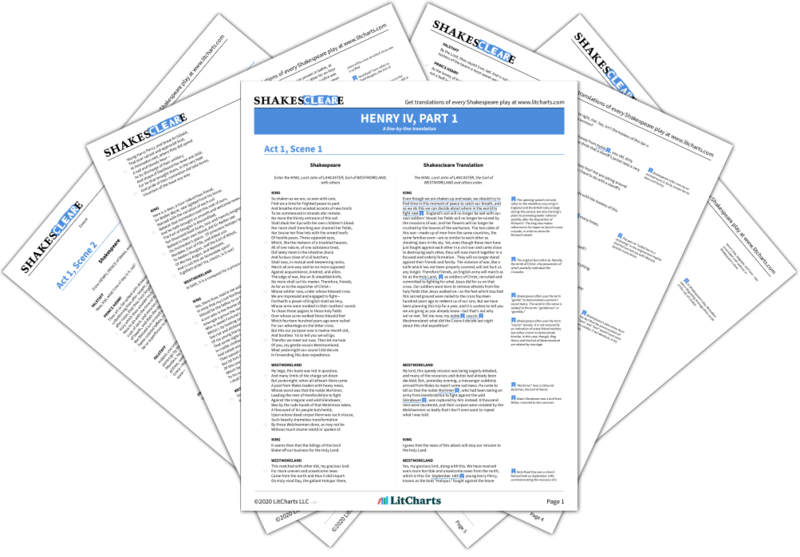 Instant downloads of all 946 LitChart PDFs (including Henry IV Part 1). 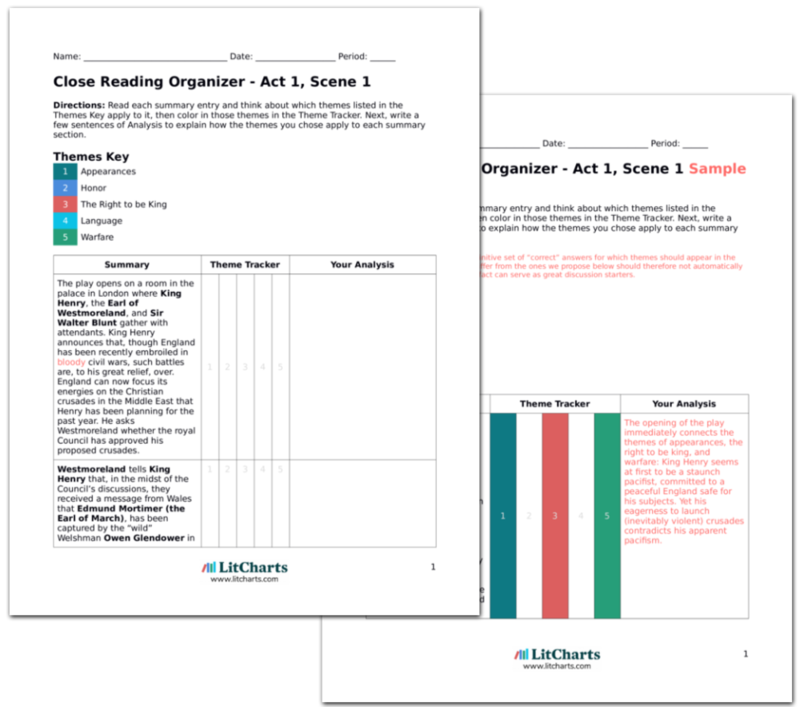 LitCharts assigns a color and icon to each theme in Henry IV Part 1, which you can use to track the themes throughout the work. This act’s virtuosic play on appearances springs into action: first, Poins conceals Falstaff’s horse, then he and Hal conceal themselves, then Falstaff claims that Poins has drugged him because he doesn’t have any of the friendly feelings for Poins that he sometimes appears to have. Falstaff’s lament ironizes the theme of honor by proposing an honor code between (dishonorable) thieves. Gadshill enters and Poins, Bardolph, and Peto come forward. Gadshill alerts everyone that there’s royal money being delivered down this hill towards the royal exchequer. Prince Hal orders the men into position to ambush travelers. When Falstaff worries that they might themselves get robbed, Prince Hal calls him a coward. Falstaff replies that he is no coward, but Prince Hal says that remains to be seen. Poins points Falstaff to his horse and exits with Hal. Prince Hal affects the appearance of allying himself with his friends (when he is secretly planning to rob them with Poins). Falstaff claims that he is honorable just because he says he is, but Hal insists that honor can only be acquired through actions, that Falstaff must prove himself honorable through his behavior. The travellers enter and Falstaff, Gadshill, Bardolph, and Peto stop them, demanding money. They drive the travellers offstage. Prince Hal and Poins enter in disguises, prepared, as Prince Hal says, to “rob the thieves” for a good joke. They hide. Falstaff, Gadshill, Bardolph, and Peto re-enter, with Falstaff declaring Prince Hal and Poins “arrant cowards.” As they’re dividing the loot, Prince Hal and Poins ambush and rob them easily. Falstaff and the others run off, surrendering with hardly a fight. Prince Hal and Poins exit, pleased with themselves. As they predicted, Prince Hal and Poins are easily able to rob their friends, whose claims to honorable bravery are revealed by their cowardly actions to be nothing but hollow language. Ross, Margaret. "Henry IV Part 1 Act 2, Scene 2." LitCharts. LitCharts LLC, 18 Jun 2014. Web. 25 Apr 2019. Ross, Margaret. "Henry IV Part 1 Act 2, Scene 2." LitCharts LLC, June 18, 2014. 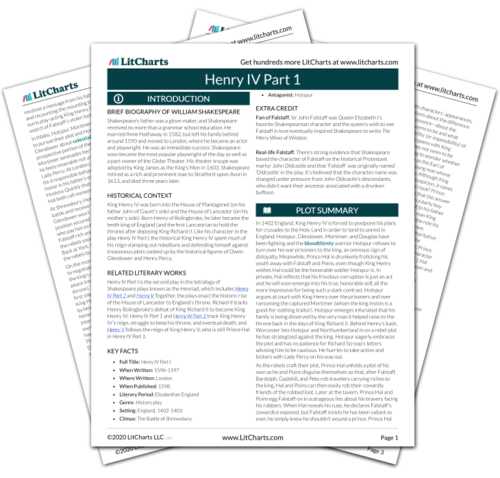 Retrieved April 25, 2019. https://www.litcharts.com/lit/henry-iv-part-1/act-2-scene-2.